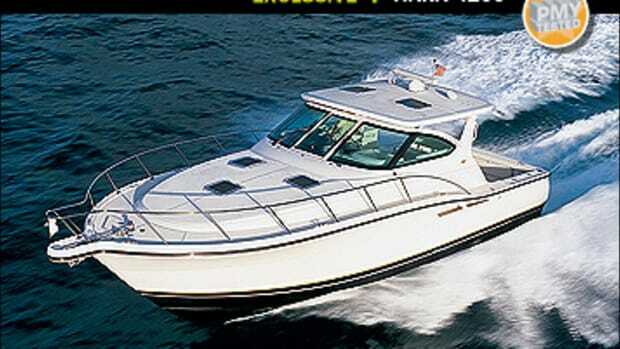 When you step through the hefty transom door from the optional swim platform and onto the aggressive diamond nonskid of the Tiara 3200 Open&apos;s cockpit sole, you&apos;re stepping onto history. How so, you ask? Well, while not as momentous an event as, let&apos;s say, the discovery of a tenth planet, this boat represents a milestone for a family-owned business from Holland, Michigan, that is approaching its 30th year of building boats. It all started in 1946 when Leon Slikkers walked into the joiner department at the Chris-Craft factory in Holland and began his first shift making cabin tops. And while the idea for the first Tiara was still many years away—Slikkers would not found Tiara until 1974—the desire to not only be part of the boatbuilding community but make it better was already taking hold in his mind. Slikkers went on to start his first company, Slickcraft, in 1955 and, after selling out to AMF almost a decade and a half later, began to solidify his boatbuilding vision. First came S2 sailing yachts (because of a noncompete agreement with AMF) and Tiara. Pursuit followed in 1977 (in 1987, S2 would cease sailboat production). 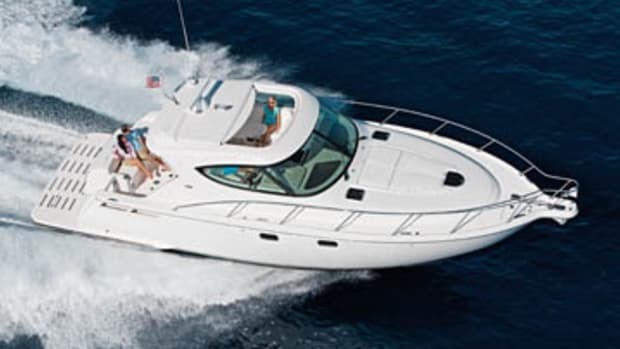 Two years later the first of the Tiara 3100 Series was launched, a line of boats that would go on to become the most successful in the company&apos;s history. In January the 3100 will make way for the 3200 Open, which is both a foot longer and wider than her sibling and equipped, according to Rob Everse, Tiara&apos;s marketing manager, with a host of enticing standard features (like 12,000-Btu Marine Air air conditioning) and plenty of options. 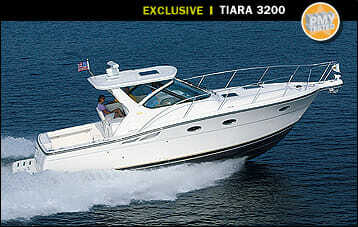 Considering the success of the 3100 and the adage "If it ain&apos;t broke, don&apos;t fix it," you might wonder how Tiara made this boat different. So did I. To answer that question and a couple of others, I spent a day aboard a 3200 with Everse as she was being delivered to her new owner at the Portland Boat Works marina in Portland, Connecticut. Luckily for me, a new 3100 Series Limited Edition was docked right next to her. I immediately noticed subtle differences in the two boats&apos; profiles. 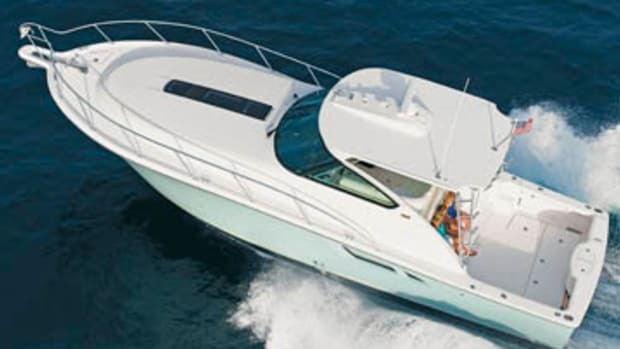 The most apparent are the 3200&apos;s reverse transom compared to the 3100&apos;s traditionally squared-off aft one, composite windshield frame—the 3100 has an aluminum frame—and an optional hardtop built specifically to blend in with the 3200&apos;s new profile. That windshield, by the way, has an electrically operated opening lower section in the center pane, three washers and wipers, well-placed grabrails to either outboard side, and distortion-free tempered safety glass. In addition, the corner pilasters found on the 3100 are gone, thus providing better sightlines to either corner. "We&apos;ve also built in lots of room for wiring runs right up here in the hardtop," Everse pointed out. I could see how that would result in a clean-looking electronics installation. The hardtop also had a pair of screened Bomar hatches, a pair of flush-mounted stereo speakers, and built-in lighting, which includes a pair of reds for running at night. Everse pointed out more changes, including the addition of Tiara&apos;s trademark retractable transom lounge, an in-house fabricated composite fuel tank, and improved scuppers in the self-draining cockpit with a new plenum-style draining system that Everse says can empty deck water four times faster than the 3100&apos;s design. Looking at her cockpit, I could easily see how that extra foot of width and length gave the 3200 an edge over the 3100. With more than 68 square feet, she could handily serve the dual purposes of cruising and fishing. 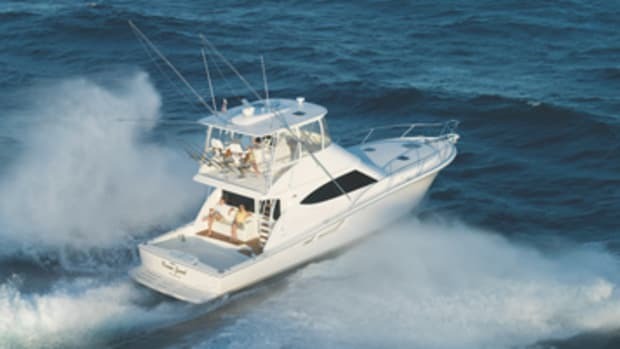 An in-transom baitwell can replace the fold-down lounge, and the starboard aft-facing seat just behind the helm seat can be swapped for a bait-prep station. (A wet bar and refrigerator are two more cockpit options.) Other fishing options include four Lee rod holders and port and starboard gunwale stowage lockers. 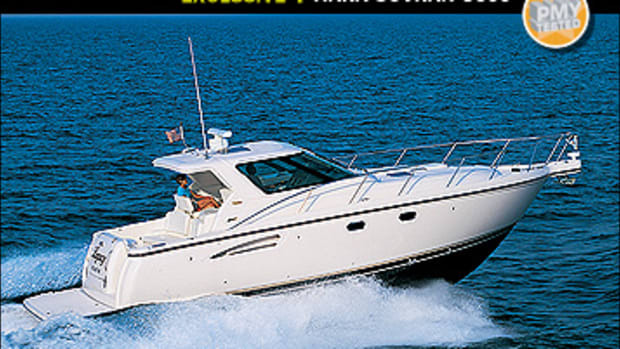 The 3200 can even be topped off with a custom-built half-tower and &apos;riggers. "That tower is one of the few things we do not do in house," Everse pointed out. Just as Tiara designers maximized the added length and beam above decks, they did so below. The interior of the 3200 is remarkably spacious for a 32-footer and compares quite favorably to similar boats, including the 3100. At 6&apos;2", headroom in both boats is practically the same, and each has six portlights and three Bomar overhead hatches, thus offering plenty of ambient light. But there is a difference in the port galley areas. The 3200&apos;s Corian countertops are on one level as compared to the two levels found on the 3100. Whether this is a better feature seems more personal than functional. Still, 3100 owners partaking in a survey requested this change. There are also covers for the stainless steel sink and two-burner electric stovetop now, and I noted plenty of cabinets and drawer space in both boats. However, while the 3200&apos;s under-counter refrigerator is a little small for cruising, by ordering the optional second refrigerator/ice maker for the cockpit, you&apos;ll have more than enough space for provisioning for a long weekend&apos;s excursion. I found another big difference in the two boats&apos; sleeping accommodations. 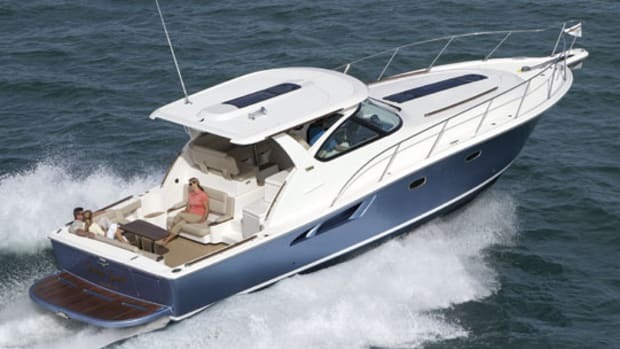 Where the 3100 had a forward double berth with a filler cushion, the 3200 features a queen-size pedestal berth with a step to either side and a stowage compartment beneath the mattress that opens up easily via a pair of gas-assisted rams. For more sleeping space, the dining settee to port easily converts to a sleeper below—the 3200 has a hi-lo table, whereas the 3100&apos;s table had to be manually dismantled and stowed—and a Pullman berth above. The arrangement makes it a perfect spot for the kids. 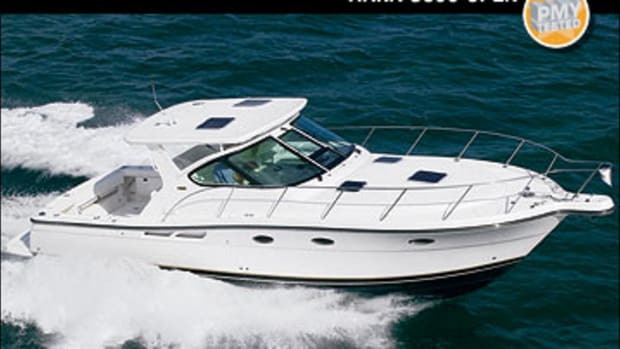 As for stowage, with the available area under the island berth, a port-side closet in the forepeak, cabinets above the dinette, and deep hull-side shelves, the 3200 provides ample room for a long weekend or even for some extended cruising, as does the 3100. 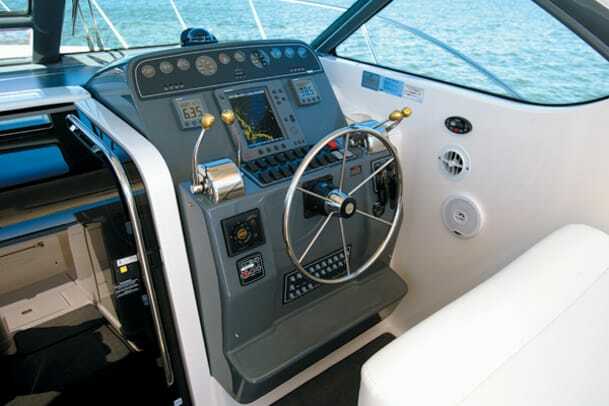 To finish off a nicely designed interior, my test boat had the optional teak-and-holly sole (long a popular Tiara option), a standard 15-inch Sharp Aquos LCD television in its own cabinet (with a stowage locker behind it), and a Clarion four-speaker AM/FM stereo/CD player. One thing that hasn&apos;t changed between the 3100 and 3200 is quality construction. Tiara has long been known for a rugged yet beautifully finished build. However, on this calm day, the waters of Long Island Sound would offer no opportunity to test either her strength or seakeeping ability. Nevertheless, I noted her excellent sightlines all around, but did observe a fair amount of bow rise as I brought her through the 3000 rpm mark. I also noticed a nice turn of speed. 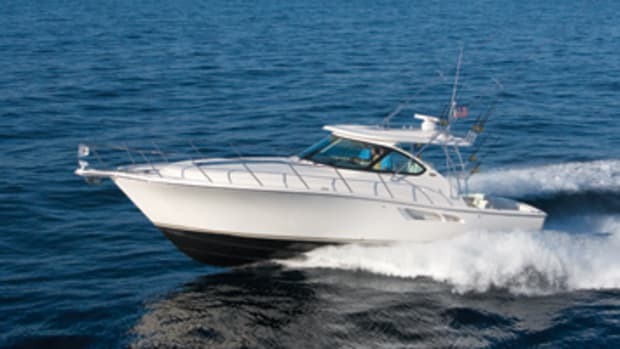 My test boat had a pair of 385-hp Crusader 8.1 MPI gasoline inboards, which, according to my radar gun, produced a WOT speed of 34.7 knots (39.9 mph). When I settled her in at a comfortable 3500-rpm cruising speed, she registered 26.8 knots (30.8 mph). She&apos;s also got decent cruising range: With all 256 gallons, my test boat should see a 170-NM range at a 3500-rpm cruise. Replacing a popular boat like the 3100, after an almost 25-year run, may at first seem a daunting task. 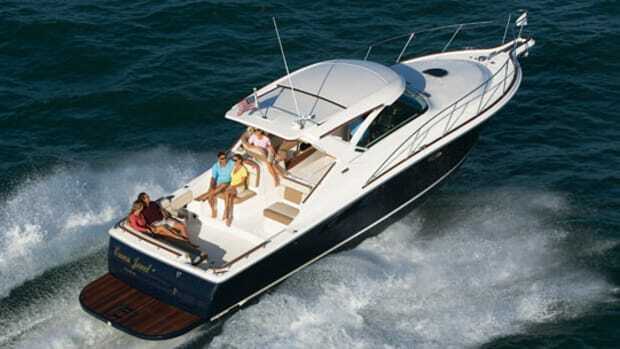 But give the 3200&apos;s added length and beam, extra features, and subtle yet important styling changes, this new boat seems quite able to step right into the line as the heir apparent in this size range.